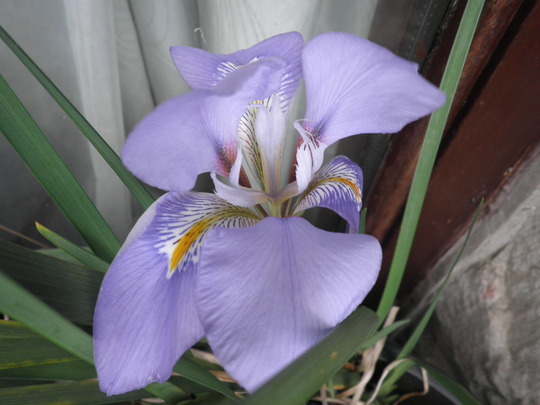 Spotted this iris in the corner in a pot of a grass plant dug from my mothers' garden. Must have hitched a lift! Does it grow from a bulb or rhizome? Stick your fingers in then!!!! not sure i could follow meanie's remark but that flower is just gorgeous! lucky you ~ i would be more likely to get grass instead of the plant. It looks like a form of Iris Unguicularis (was Stylosa)colour is Variable and has little or no stem, normally flowers now. Ask Alex on Corfu they grow wild there. If you do stick your finger you will find a rhizome. Very nice stowaway you have there. Fabulous pic Stevie....what a little beauty! this is my fave flower the color is very beautiful! !